300B/2A3/45/50/5U4G/274B/5R4/6X5/3B22/3B27/3B28.. etc ...expansion testing module is available now +$380 !! module can test above tubes and even 845/211...etc +$680 !! 5. Easy calibration by just one calibration pot with digital meter indication, typical cal. to +/- 0.5% of 100.0 will be good enough for testing with 1% accurancy. User can easily check cal. reference before test to make sure equipment in top notch condition. 10. High stability and reliability, high precision and repeatability with all digital readouts. 11. 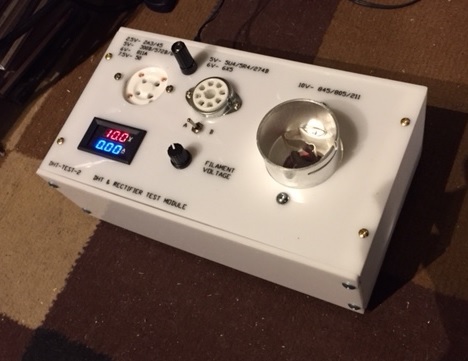 Self-explanation panel, anyone can test a vacuum tube in seconds, no more steep learning curve. Easy and well guided user manual included.